The World Onshore Pipelines Market Forecast considers the prospects for the onshore pipelines construction business and values the future capital expenditure (CAPEX) and operating expenditure (OPEX) markets through to 2023. 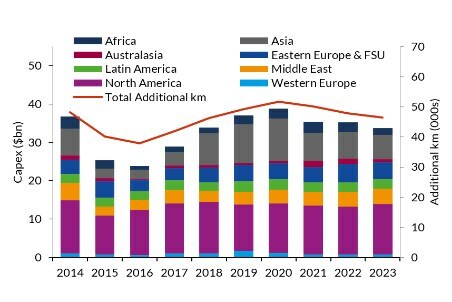 Global installation activity and expenditure for onshore pipelines in the near term is expected to be bolstered by a number of large pipelines in Africa, Asia, and Eastern Europe and FSU, as detailed in the latest edition of Westwood’s World Onshore Pipelines Market Forecast. Additional capacity in the near term will also come from projects designed to alleviate bottlenecks in takeaway capacity in the Permian basin in the US. A decline in activity is expected post-2020, with some pipelines having experienced delays and cancellations since the release of the previous edition of the report, including the Trans Mountain Expansion pipeline in Canada and the Djibouti-Dire Dawa-Awash (Horn of Africa) from Djibouti to Ethiopia. Despite this trend, Westwood expects the market to remain resilient, relative to the previous five year period, with total forecast expenditure expected to increase by 21% compared to 2014 - 2018, with key project announcements in 2017 - 2018 having resulted in an uptick in forecast expenditure for regions such as Australasia. The report also provides a comprehensive technical overview of the project development process, from front-end engineering and design (FEED) through to engineering, procurement, construction (EPC), and operations and maintenance. It is therefore an essential tool for companies operating across the supply chain, from steel mills and original equipment manufacturers (OEMs) to pipeline operators and integrity service providers. Despite a 14% rise in 2019 - 2020, global capital expenditure is forecast to decline at a 2.4% CAGR over 2019 - 2023. Total expenditure over 2019 - 2023 is expected to amount to US$180.3 billion, representing a 21% increase when compared to the total for the 2014 - 2018 period. North America has historically accounted for the largest proportion of the market, representing 42% of global expenditure over 2014 - 2018. Westwood expects this to continue over the next five years, albeit with a reduced share of 35%. Asia is expected to see the largest increase in total capital expenditure for 2019 - 2023, when compared to the total for the previous five years. Overall spending in the region over 2019 - 2023 is expected to rise by 76% compared to the total for 2014 - 2018. Westwood expects a 12% increase in additional kilometres installed in the near term (2019 - 2020) to be supported by a number of key projects currently under construction, including the 1400km Hoima to Tanga crude oil pipeline from Uganda to Tanzania and the 4000 km Power of Siberia pipeline from Russia to China. Additional capacity in North America is also expected to come from projects designed to alleviate the bottlenecks in takeaway capacity in the Permian basin in the US, including the Cactus II and EPIC pipelines. Additional projects such as the African Renaissance Project (ARP) pipeline from Mozambique to South Africa and the planned Eagle Spirit pipeline in Canada are also expected to contribute to expenditure towards the end of the forecast. For more information on this report, please contact Gareth Hector or Katy Smith to arrange a review call of the key report messages on 44 (0)1795 594726.